Beautiful CAS cards. Thanks for sharing! Two lovely CAS cards. I liked your creativity in making that vase on the second card. Really cute CAS cards! Beautifully done. 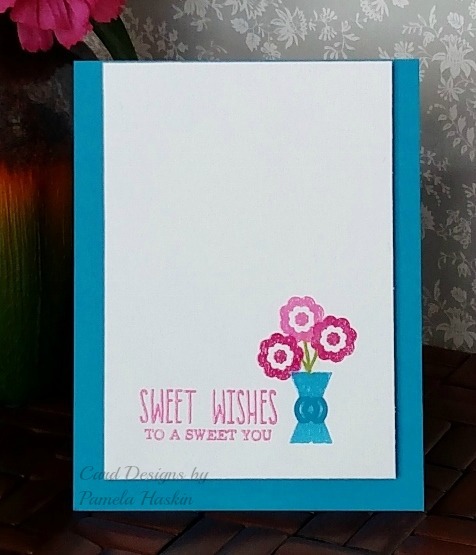 It's always good to have extra cards on hand, plus it's just fun making them anyway! Great job! WOW! I never even thought of doing a card like this with the cake. It is gorgeous! 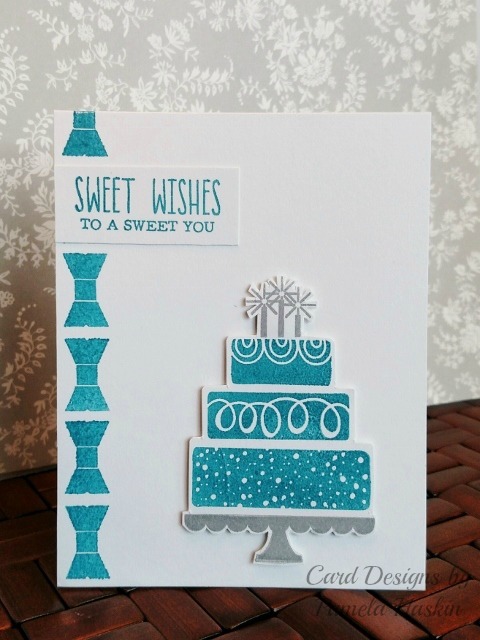 Very elegant and original card! Very cool way to use the bow, and such pretty fresh colors. Sweet cards. I like the bow border on the first one. Darling cards. I must say that I love when someone shows me another way to use my stamps. This was so creative. Thanks for sharing. Your second vase card is so creative. Great way to maximize and stretch the stamp set. Great cards. Oh Pamela your Birthday cards are Fabulous!!!! Creative use of a bow stamp for a vase! Love it! I'll have to look at my Stamps in a new way! Love both cards! Cute, and so creative!! That bow has lots of uses!! Delightful cards! Love that fun cake! Not only is that cake completely adorable but how much do I love the colors you picked. Love the Clean & Simple look to these cards ! You are so clever! I always love how clean and simple you can make a card, yet really find ways to make them so different! I love how you used the bow as a vase. Love the colors & the simplicity of the cards. I love your color choices. I never would have thought of using paper crafts to illustrate a book, but now that I know you did that I will have to keep it in mind. Both of your cards are so pretty. Love the clean and simple look and sometimes I think its harder to achieve that look than a fussy one. Thanks for sharing.